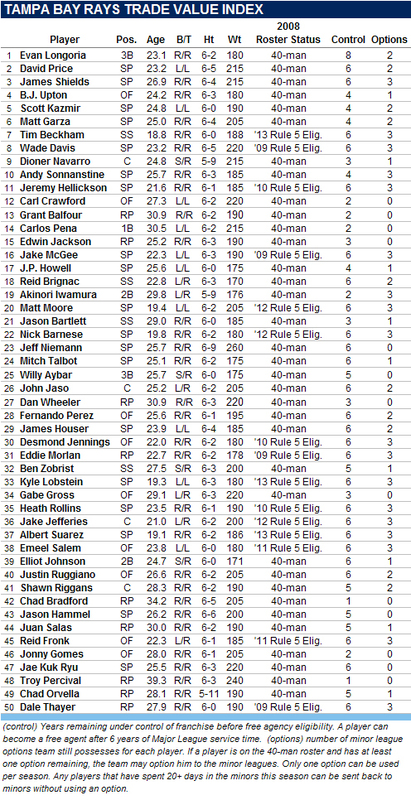 Last week we updated our 40-man and 25-man roster projections for the 2009 season. With free agency now in full swing, the Hot Stove is upon us. Therefore it is time to update the Tampa Bay Rays “Trade Value Index” in which we rank the value of top 50 players in the Rays organization. The TVI ranks every player on the 40-man roster and the top prospects in the organization. Our goal is to determine which players in the organization are the most valuable to the team. The rankings consider a number factors in addition to talent and good looks, such as potential, age, contract and depth of position in organization. This last factor comes into play if one player is stuck behind another player with more ability. For example, Fernando Perez would be a little higher due to his exceptional speed and strong OBP, but loses a little value because we have to keep reading stories about how he overcame his handicap of having been a Columbia University student, and some more value because the team has BJ Upton in center field for years to come. We do use a very rough mathematical formula that gives differential weights to the various factors. This gives the list a starting point which is then tweaked based on the discussions of several committee members that may or may not have been under the influence of alcohol. Keep in mind that in many instances there is only a very slight difference in value from one position to the next in which we could easily make a strong argument for swapping two players in the rankings. That being said, we are fairly confident that most players are within a couple of spots of where they should be…Or not. Feel free to tell us where we screwed up in the comments. Notice that 10 of the top 11 are under team control for at least the next 4 years, and we expect the 11th (Dioner Navarro) to be locked up to a longterm deal this winter. We have been updating this list every few months for over two years now and this is the first time that Scott Kazmir was not in the top spot. This time, there were arguments for everybody in the top 4 (Evan Longoria, David Price, James Shields, BJ Upton) to be #1. And while there was some sentiment that Matt Garza has surpassed Kaz, the concerns about Garza having a tired arm in 2009 and the fact that Kazmir is both a lefty and the youngest pitcher in the rotation gives him the edge. After Garza, the next group of about 12-13 players consists of the top-tier prospects and younger key contributors to the everyday lineup. This group is led by Tim Beckham. The top pick of the 2008 draft would be in the top 3 of most organizations. Carl Crawford is starting to slip down the list. With only two years left on his contract, a history of injuries and a talent-level that appears to have already plateaued, he is no longer the most valuable position player. Jake McGee was the biggest wild card. There was some sentiment that he was still a top 10 commodity, while others felt he had little value until he was back on the field. Keep in mind that many pitchers need two full years to get back to 100% after Tommy John surgery and some never get back at all (Wade Townsend). One of our rules of thumb is to not get too excited about most prospects until they do something above single-A. But we made an exception for Matt Moore and Nick Barnese. The early reports on both are very promising and the numbers are too good to ignore. But if the 19-year olds slip up even a little, they will tumble down the list quickly. While there are currently openings on the 40-man roster, should the Rays need additional spots in the future, the most likely DFA candidates will come from the bottom of this list. Jason Hammel, Juan Salas, Jonny Gomes, JK Ryu, Troy Percival and Chad Orvella make up the least valuable players on the 40-man roster. Percival is safe, but his age, $4 million salary and questions about his health leave him with very little value at this point. As usual, a very reasonable list. I would probably reverse the positions of Pena and Balfour. As good as Balfour was, I think it is easier to replace a reliever than a power hitting, high OBP, good defensive first baseman, and while the system is rich in pitching which might yield some fine bullpen arms, it is very thin in position players and almost bare at 1B. They are the same age and are under team control for the same length of time, so the only other factor that might come into play is the added expense of Pena's contract, not enough in my view to trump the other factors. At this point also, Pena has performed at a high level longer than Balfour so that Grant is more likely to prove a flash in the pan. funny you mention that one. we actually did have those two reversed through most of the process and only moved them at the very last moment. the argument: Balfour's season was historic (statistically) and a regression is very likely, but even if he does regress, he should still be very good. And while Pena is much more than his 30 home runs, the distance from him to the average first baseman seems less than the distance from Balfour to an average relief pitcher. But we would have no problem swapping the two. Balfour is tough. How certain are people that he can become a dominant closer? Have a feeling that (outside the Bay area at least) there are just as many in that camp as there are in the camp that think 2008 was a fluke. I guess I would have probably weighed the two and placed him a few slots lower. Maybe behind Edwin? Great list. CC seems just a little high up the list to me... injuries, lack of personal flexibility about moving to CF if needed, knees on field turf, historically rolling short of his perceived potential. Good work. there was some thought to moving CC a little further down the list, but ultimately we think there is still a lot of sentiment out there that Crawford is one of the "most exciting" players in baseball when healthy and he is just now reaching his prime. His contract isn't cheap any longer, but it is fair for what he is capable of. With only 2 years left on the deal, he will start to lose value pretty quickly once the trade deadline passes in 2009. Pena had, what, 2 errors on the year, and a gold glove? I'm surprised to see him that low. only 2 years left on his deal and he is on the wrong side of 30, so he could keep this pace but he isn't likely to get any better. and his offense is about average for first basemen in the AL. I think your point about Pena compared to other first basemen is legitimate, but while I don't think any comparable first baseman is available to the Rays, I do think it possible that they can replace Balfour. And possibly in the same way they acquired him, in a "minor" trade or via the bargain bin of free agents. That is why I would reverse the positions, because I think Pena's value to the Rays is as important or more so than Balfour's and much harder to replace adequately. I don't mean that Balfour's 2008 performance is easily replaceable, but with expected regression, I do think it is in 2009, and also think there is a far larger pool of Balfour type talents available than Pena types. Did you intentionally leave Howell as a "SP"? As a starting pitcher his value is low, but as a long-reliever his value jumps way up-- in my ever-so-humble opinion. I agree with the Garza over Kaz argument, but I think next season will be the biggest indicator of things to come for both of these pitchers... that could be bad news if Kaz struggles again, because his value will plummet. I am surprised Jaso is higher than Riggins. Do you think Jaso could make the team out of spring training? I have heard his defense is bad. Do you think he has potential as a DH? keep in mind Riggans age. He will be 29 next year and he is below average behind the plate. off the top of my head i think he threw out 1 of 25 base stealers and the 1 was on a missed hit and run. Jaso is getting better defensively and a very good bat. power? maybe not. but very good bat and DH is not out of the question. DBF, yes, the Howell as a SP was a typo. He is a full-fledged reliever now. as for Navi and Beckham. Well, there was some sentiment to raise Navi as young catchers that are above average defensively and offensively are very rare. any other team and Navi might be top 10. but on the Rays? And let's not forget that Beckham is still very young. let's give him a full year. Right now he projects as a BJ upton, with a little less power and a whole lot more SS glove. Is there any particular reason why Aki barely makes the top 20 or is it just becasue there's a log-jam of talent at the top? Think of it this way. If Aki was on another team and the Rays needed a second baseman. Who would they be willing to trade even up for Aki? By our feeling they would NOT trade Brignac (although that is certainly debatable) but they would trade a lower level prospect with high upside like Moore. howell is a better relief pitcher than Jackson is a starter. But starters are valued much higher. As RR said earlier, it is much easier to replace a relief pitcher. And even though Price is waiting Rays will still command more for Jackson than they would for Howell.